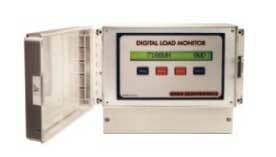 The Digtial Load Monitor offers high accuracy mesurements with a backlighted LCD display and serial communications. The DLM provides per-phase and poly-phase measurements for current, voltage and watts and vars. The DLM also has resetable registers for demand and consumption and has pulse outputs that can be configured as threshold alarms. Programming is acomplished either through the sealed membrane front panel or through the dual RS-485 communication ports. The DLM comes standard as a panel mount unit but can be purchased with the optional NEMA enclosure (as shown). All this for under $800. Ohio Semitronics, Inc., 4242 Reynolds Drive, Hilliard, OH 43026. Tel: 614-7771005; Fax: 614-777-4511.